The winter of 1999 was blowing through Nebraska, USA when I closed the door to my parents’ garage. Basketball season and the district finals drew me to my high school that evening as my mother sat uncomfortably, her tears tied to a sound-trigger that the ignition key would soon pull. As the engine turned over and resulting sound waves pushed past permeable drywall, a twin sensation floated between us: I was growing up. To 16 year-old me, driving the car alone for the first time was a Significant Moment of Teenage Freedom. For my mother, it was Significant Moment in Parenting. She cried for me, for herself, and probably – if her tears could reach as far – for all parents everywhere who see their children flash-fried into adolescence. Diego Capel’s number 17 lit up the fourth official’s board in green-means-go on October 24, 2004. 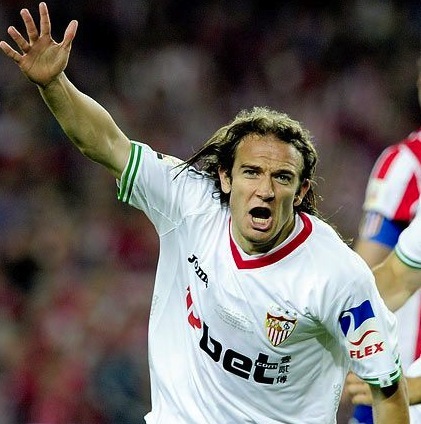 He and all sixteen of his years saw their first three minutes of La Liga football against Atlético that evening. Somewhere in Nebraska, USA mom’s tears loosened again. He was the second youngest to ever play with the A team, bested only by José Antonio Reyes’s youthful debut in 2000. After his premiere he went on to play in 125 matches with the first team over seven seasons. 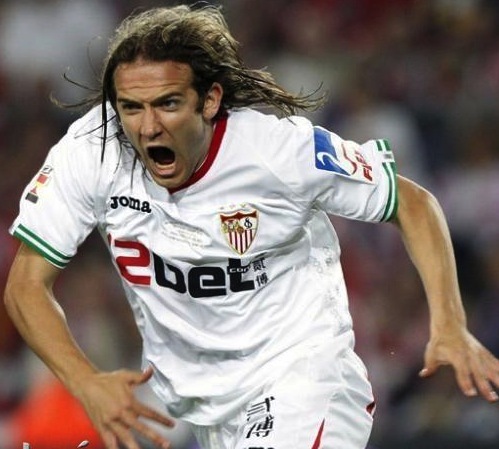 Looking back at his career with Sevilla, I’m confident in saying that he was a good player for us. I’d tend to reserve the word “great” for players like Kanouté, Palóp, Lufa, Navarro, Navas or Alves from the same era. His legs were his greatest asset, and they made his furious raids down enemy wings dangerous whether or not he found a ball to kick once there. The highest lights of his career probably came during our 2010 Copa del Rey campaign. He was essentially the sole reason we came out of the Camp Nou with a 1-2 victory (2-2 agg), finding himself alone at the back post for the first and winning a penalty that lead to the second. In the final, he scored the winning goal with a blast from the top of the 18. His homeless guy ugly mug was all over the morning paper, and it was a happy homeless mug. This brings me to Diego Capel’s ‘other’ skill. He’s been called ‘Homeless guy‘ before because of his awesome hair, but he’ll always be known around here as Diego ‘Dead Man’ Capel. This moniker recognizes Capel’s completely unique style of receiving fouls in which he drops dead to the ground and lies their motionless. I’ve never seen another player fall to the ground in a similar way: no writhing, no holding of body parts in the air, no theatrical moaning or shaking of the hand, he just…dies. 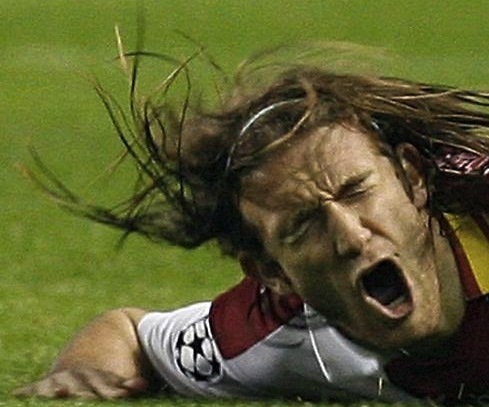 While he’s earned a reputation for being a bit of a diver (and I don’t think any of us can deny its place in his game), he’s earned a distinguished entry in The Annals of Getting Fouled. Here’s one example: We’ll miss you and your many deaths, Diego! !